This unique resource contains practical, doable ideas for visuals to use in worship. 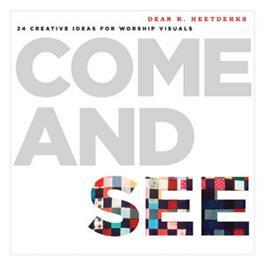 This unique resource offers practical, doable ideas for creating visuals to use in worship. You'll find plans for constructing banners, paraments, installations, and other visuals using avariety of media such as fabric, paper, drawing and painting, andprojection. Come and See offers season- specific projects, visuals to celebrate special events,intergenerational projects, and more. It's an excellent resource for visual arts or worship committees or for anyonewho seeks to glorify God through creativity. "It is rare to come across a resource by an author with so many talents needed in the church today related to visual expression: the talent of a graphic designer, the weekly experience of working on liturgical art in a church setting, and the sensitivity to good theology and worship practices. You will find all of these in this practical resource of 24 projects for your intergenerational worship." Dean R. Heetderks is director of Proservices, the design group that serves the Christian Reformed Church; and art director of the magazine "Reformed Worship." He and his wife, Vicki, also a graphic designer, live with their three children in Caledonia, Michigan. He dreams of one day becoming a "real artist."